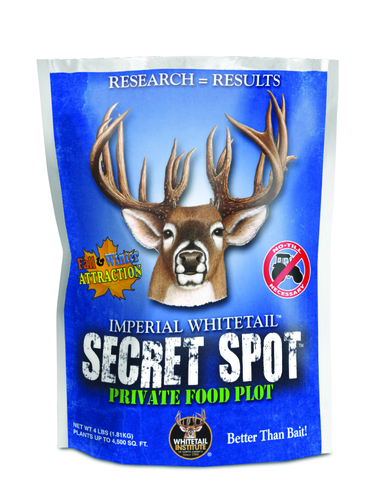 Plant your own personal food plot known only to you and your deer with Imperial Whitetail Secret Spot. Imperial Whitetail Secret Spot is an annual forage specifically designed for smaller, remote food plots – areas known only to you and your deer! Secret Spot works well in small openings in the woods, on high places in swampy areas, and in just about any area where sunlight reaches the ground – just clear the area of existing vegetation and expose the soil to ensure seed-to-soil contact. Preparation can be done with as little as hand tools. Plant Secret Spot in the places that only you and your deer will find.